Allow us to handle every detail so that you can be a guest at your own wedding reception or dinner party! The HarborView…steps above! Thank you for considering our location for your upcoming event. The HarborView Room above Kingfish Grill is a distinctive waterfront venue located near the heart of historic downtown St. Augustine. Only the Kingfish Grill takes care of every detail – even those you haven’t thought of – creating an event that is uniquely yours with memories that will last a lifetime. From weddings & social gatherings to corporate and community events, we’re proud to showcase our scenic banquet floor, open-air deck and fabulous culinary creations. We know just how to prepare your custom menu. Whether a cocktail reception or seated affair, from casual to gourmet, your enjoyment is our genuine concern. Catering is about satisfying all of the senses. The Harbor View offers stunning 2nd story views of the Intracoastal Waterway, Camachee Cove Yacht Harbor and the teeming tidal marshes of Saint Augustine. Serene décor, new furnishings and a stone fireplace are some of the amenities that complete the distinctive ambiance for your important event. A sparkling pool and lounge deck below can also be reserved for your guests. We are happy to customize any packages and our event professionals are here to serve all of your needs. You may request more information or contact an event professional by filling out our banquet information request form. 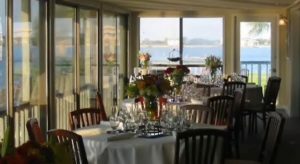 Visit harborviewbanquets.com for more room rental and banquet menu information.